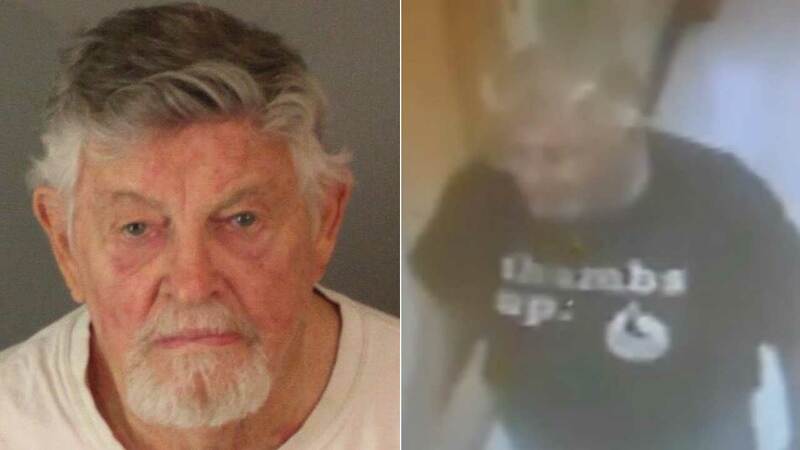 Theodore Childers, 78, is seen in a booking photo, left, and a surveillance still image, both released by the Riverside Police Department. RIVERSIDE, Calif. -- Social media tips helped Riverside police arrest a 78-year-old man for allegedly trying to lure a 6-year-old girl with the promise of a "treat" at a local market. Theodore Childers was arrested on Thursday. He was found and detained at a Planet Fitness gym on Chicago Avenue in Riverside, thanks to tips from concerned citizens. "Anytime you have someone trying to commit or attempt to commit a crime against any of our young people or kids, it's really disheartening and disturbing," said Officer Ryan Railsback with Riverside police. Authorities said the luring attempt happened on Feb. 15 in the Food 4 Less located at 3900 Chicago Ave. Riverside police released surveillance video of the incident. Riverside police said a man attempted to lure a 6-year-old girl with a "treat." The young girl was walking toward the bathroom when the man attempted to lure her toward him by telling the child he would give her a treat, according to police. Detectives said the suspect was standing near the men's restroom entrance when he attempted to lure the girl toward him. The surveillance video shows the young girl stop, then proceed into the women's bathroom. She was not harmed. "I think that's excellent parenting skills that she was shown that not to go with any strangers and to get an adult," said area resident Cynthia Aguayo. Cynthia and Aurelio Aguayo have nine children. They expressed concern when they saw the man's image on the news, because they shop at that Food 4 Less. However, another shopper said she was not surprised at the incident, given the other crimes known to occur in the area. "Drugs, prostitution, everything, real bad area," she said. Childers likely faces a misdemeanor charge of child annoyance. If you have any further information about this case, you're urged to call Detective C. Olivas with the Riverside Police Department at (951) 353-7136.